ISIS has lost almost a third of the territory it once held in Iraq and Syria, according to a new analysis. The amount of ground controlled by the group has shrunk from around 90,800km2 since its height in January 2015 to 65,500 km2 as of October 3, research by security analytics firm IHS found. This means ISIS now controls territory roughly the size of Sri Lanka. The territorial losses came ahead of the Iraqi government's operation to recapture the city of Mosul, ISIS's last major stronghold in the country. While the trend has slowed over the past three months – ISIS has lost just 2800km2 since July – the losses are strategically significant because they have been concentrated in northern Aleppo province, IHS said. 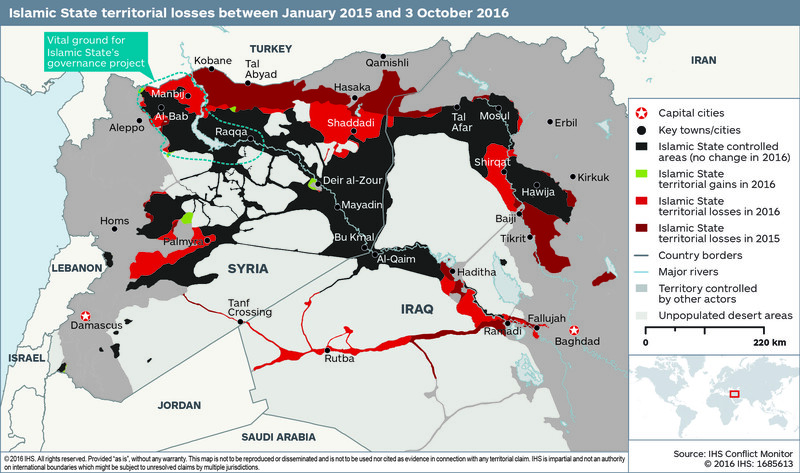 “The Islamic State’s territorial losses since July are relatively modest in scale, but unprecedented in their strategic significance,” said Columb Strack, senior analyst and head of the IHS Conflict Monitor . Strack said the loss of direct road access to cross-border smuggling routes into Turkey severely restricts the group’s ability to recruit new fighters from abroad.